Home Situation: I live in a 3,000-square-foot house with my husband (38, writer), and our 2.5-year-old daughter. My husband works from home but travels last minute a lot. 6:30 a.m. As is typical, our daughter, E, wakes up early when we can actually sleep in, we cuddle in bed for 30 minutes. 7:00 a.m.–8:00 a.m. I get up and prepare breakfast for the two of us, whilst my husband gets some more sleep, and I Skype my mother who lives abroad at the same time. 8:00 a.m. I shower and get dressed whilst husband dresses E.
9:00 a.m. We decide to go to the zoo, and it takes us about 30 minutes to be ready. Nothing is ever quick anymore! 9:00 a.m.–12:00 p.m. We explore the zoo and successfully use the public toilets for the first time with E — we’re potty training. 1:00 p.m. We grab a quick lunch on our way home. 1:30 p.m. E fell asleep in the car. I tried to gently put her in her bed but of course she woke up immediately, then spend almost two hours trying to put her back to sleep. Naps are important for her routine and ours! 3:00 p.m.–4:30 p.m. We all nap. 4:30–6:00 p.m. We go to our neighborhood pool and give E a snack there. 6:00 p.m. We go home. I take a bath with E whilst husband goes to get sushi. 8:00 p.m. Bedtime routine starts. We usually split the tasks equally, brushing teeth, hair, etc., and we also both read her stories in both languages. (We come from two different European countries and want E to be bilingual.) This process seems to be taking longer each day; she finally falls asleep at 9:00 p.m. after getting up three times under various excuses. 9:00 p.m. We were going to watch a movie but are too tired, so we both check emails on iPhones and fall asleep. 6:45 a.m. My alarm clock goes off, I checked if I have urgent emails, respond, and then I get up, get showered and dressed and wake up my husband who in turn wakes up E.
7:10 a.m. I put my make up on whilst husband dresses E, and then I do her hair (husband can’t seem to master that). 7:20 a.m. We all have a quick breakfast together (green smoothie for me that I prepare the night before and cereals for them). 7:45 a.m. I take E to daycare, husband works from home, and I suspect he goes back to bed for a little while. He’s really not a morning person and he only started getting up with me when we had E.
8:15 a.m. I get to the office, check emails again, and go grab a coffee with my team whilst we catch up on what we did over the weekend. 8:30 a.m. Daily team meeting — some of my direct reports are abroad so it’s the only time we all have together to connect. 11:30 a.m.–12:15 p.m. I have back-to-back meetings but I blocked this time to go to our onsite gym. I’m really fortunate we have one and I really try to make the most of it. I grab a quick lunch and eat at my desk. 5:15 p.m. I suddenly realise the time and shut down to get E from daycare. 5.30–5:45 p.m. E loves playing with her little friends, so it’s always really hard to exit daycare quickly. I usually have to bribe her with promises of fun things to do at home, and this time it’s being able to watch “The Wheels on the Bus” on YouTube… She eats a cracker in the car. I’m lucky that we only live about 15 minutes from her daycare. 6:00 p.m. Husband plays with E (and plays promised video) whilst I prepare dinner and do some more emails. It’s tamales tonight, straight out of the freezer. 6:30 p.m. We all have dinner together, although E lasts about 10 minutes and then I have to feed her whilst she’s playing on the floor. 7:00 p.m. I tidy up, husband goes upstairs with E to take her potty, I check emails again. 7:30 p.m. Bedtime routine starts: I wash E quickly whilst husband does a few more work emails, we then both read stories. 8:45 p.m. E is asleep; we go watch the end of House of Cards. 10:00 p.m. We go to bed, I do some clothes shopping online, and fall asleep just before 11:00 p.m. Morning routine is the same (almost forgot today was Splash Day, so I change E into bathing suit quickly), and so is the rest of my day — biggest difference is that husband has an assignment out of town so he’s going to be away for a few nights. 6:00 p.m. Smoked salmon and tomatoes as we have that in the fridge and we’re both starving. 6:30 p.m. FaceTime husband so he can say goodnight to E and he tells me about his day. 7:00 p.m. I start routine, hoping (foolishly) that it means that E will then fall asleep quicker. Instead she gets up four times and insists I lie on the floor by her bed, which I end up doing, and I manage to (literally) crawl out of her bedroom at 9:15 p.m.
9:10 p.m. I don’t do any of the house chores I said I’d do, and instead I take a bath and watch one of my shows on the iPad. There are few shows my husband and I agree on, so I always catch up on the ones I like when he’s on the road, which is about a week a month on average. 3:30 a.m. E wakes up screaming and then wants to be cuddled. I put her back to bed quite quickly, thankfully, so I can finish my night. This is when I really don’t miss nursing her — so glad that part of my life is over. 6:45 a.m. She wakes up, so I get dressed whilst she watches me (this is why I took a bath last night; it’s almost always the case that when it’s just the two of us she manages to wake up before my alarm clock), and then I try to put my makeup on with her on my lap. 7:55 a.m. Leave for daycare and make it just on time for my daily meeting, back-to-back meetings after that. 11:30 a.m.–12:00 p.m. Today is weight routine — I hate it with a passion but know it’s good for me. We have access to a few trainers at the gym who help us by setting routines for us about once a month, so I just follow what’s written on my sheet and get on with it as quickly as I can. 12:00–5:00 p.m. Back-to-back meetings again, although one of them is a catch-up/network coffee with an old colleague, and it’s really lovely to catch up and see what she’s been up to. 5:30 p.m. Pick up E.
6:00 p.m. Scramble some eggs, add avocados and some cheese, and voila, dinner. 7:00–9:00 p.m. Bedtime routine, including a few songs on FaceTime with husband. She really resists tonight, which isn’t helpful as I have a 9:00 p.m. call with Australia. I have to move it to 9:30 p.m. as a result. No one complains. 10:30 p.m. My call finishes, and I check Facebook and go to bed. I stupidly organized a call at 8:00 a.m. today, forgetting my husband was still out of town, so I get up at 6:30 a.m., shower and get dressed/minimal makeup. 7:15 a.m. I wake up E (of course, today she wanted to sleep), dress her, and put her straight in her carseat. I’m thankful daycare offers breakfast if you get there before 8:00 a.m.
7:58 a.m. I get to my desk just in time to start my call. It finishes at 8:45 a.m. so I go grab some boiled eggs and a coffee before my 9:00 a.m. call. I’m supposed to go to the gym at lunch but have just too much to do. I have lunch with one of my analysts instead to go through some staffing concerns they have. 5:30 p.m. I can’t believe the day is over. I go grab E, who is really happy when I tell her dad is back tonight. 6:00 p.m. I prepare dinner — shrimp and stir fry of veggies with quinoa — and husband arrives just on time for all of us to eat together. 7:00 p.m. I chill whilst husband prepares E for bed. I go up to read two stories and then leave when he deals with her numerous requests for water/potty/hugs. 9:00 p.m. We catch up in bed and he shows me some of the pics he took during the week. He finishes some emails while I check Facebook. 10:00 p.m. We’re both exhausted, and we fall asleep. 6:15 a.m. E wakes up and comes to bed with us for a bit. She doesn’t even say hi to me but cuddles her dad for a while; it’s actually really sweet. 8:00 a.m. Husband takes E to daycare as I’m working from home today, which is really great as I can do all my calls and run errands/do house chores. I was supposed to go to Zumba but I’m too tired, so I nap instead. 4:30 p.m. Husband goes to get E and we all go to the neighborhood pool. 6:00 p.m. I get some homemade lasagna from the freezer (I tend to cook in batches on weekends or when I feel like it in the evenings so I have easy but homemade options to go to), and we all change whilst it’s warming up. 6:30 p.m. We eat; again I’m chasing E to make her eat whilst she plays. 9:00 p.m. Husband and I talk about summer vacation and finally book the tickets. We’re going back to Europe to see our family. 10:00 p.m. Bed and emails. 11:00 p.m. We fall asleep. I’ve lived in the U.S. for seven years now, and the hardest part is the lack of family locally. I’ve had a number of medical issues requiring bed rest, and finding someone to help with my daughter to take her to school in the morning, for instance, has been a challenge, especially when my husband needs to travel at short notice. There is the cost as well, of course. In my home country, daycare is a percentage of your salary, when here the cost can be extortionate. We’re lucky we can afford it, but I can see why so many people have to give up their jobs to stay home, like a number of friends did (and some men, my feminist-self is pleased to say). E doesn’t wake up until 7:30 a.m., which is really nice. Husband gets up and plays with her whilst I stay in bed for another 30 minutes, then I get up and make breakfast. Toast for everyone today, and plenty of coffee for me — for some reason I need it more in the weekend than during the week. 9:00 a.m. Husband Skypes his parents. I say hi and then go have a bath. 9:30 a.m. Husband needs to write some of what he’s done this week so I take E to the splash pad before it gets too hot and manage to organize a playdate last minute with one of her little friends from daycare. 11:00 a.m. Home, we have some lunch, veggie burgers and sweet potato fries from the freezer. 1:00–3:00 p.m. E plays instead of napping, I watch her whilst husband writes some of what he’s researched this week. 3:00–4:30 p.m. She sleeps and so do we! 4:30–5:30 p.m. Neighborhood pool — we try to use it as much as possible. 6:00 p.m. I complain to husband that he never cooks anymore since E’s been born, so he cooks some fish from the freezer with peppers and pasta. I then go watch some HGTV, and he meets me just before 11:00 p.m. and we go to bed. Thanks so much to E.D. for sharing a bit of her life as a working mom! 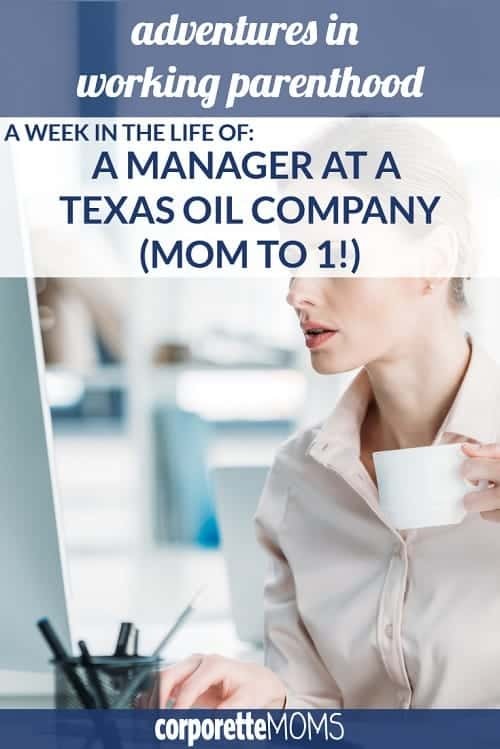 Readers, what’s your biggest takeaway from her week of work as a mid-level manager at an oil company as well as her general work/life balance? Stock photo via Deposit Photos / IgorTishenko. These are really some of my favorite posts. I don’t know how overwhelmed with submissions you are, but I know some of these are delayed from when they submit so there are updates. I’d be interested in reading longer term updates/redos from people who have done them in the past. We seem to often get questions about going from 1-2 or 2-3 kids, or how life changes with a job or relationship change. I did mine last summer when I had a 20 month old, and now I have a 3 year old and four month old twins, and my life is SO SO different now. Yes! I was a Week in the Life-er and I would be happy to post an update, because I’m curious, too! Agree! I was also featured a while ago, and things have changed a bit. I loved this one! I had to laugh at taking a nap instead of Zumba, that sounds exactly like me. 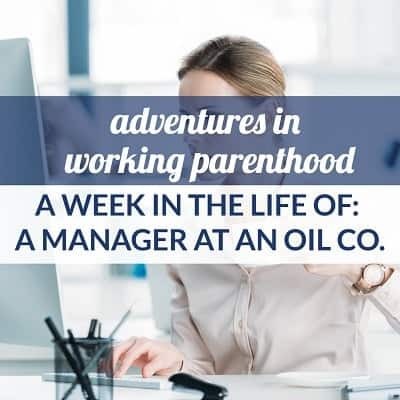 As soon as my DH gets home from a trip, all the exhaustion of solo parenting catches up with me and I can’t keep a single plan I’ve made. Thanks for sharing! My husband and I are also from Europe, so I really can relate when you describe the lack of local support network like grandparents or other family. I also work for a global company and have 8am calls (or earlier) a lot, and I commute for an hour! On days where I cannot drop off kiddo while husband is not there, I have paid one of his teachers to come to our house from 6-7:30am and drive him to daycare. It’s $$, but so worth it. that is so funny! good tip for the back up drive to daycare! So funny – our lives are so incredibly similar. I live in Texas. I am originally from a European country. I have a young daughter (mine is 3.5), and I’m raising her bilingual. My husband also works from home. The only part where we are drastically different was this: “7:10 am – make-up; 7:20 am – breakfast”. It takes me waaay longer to get my make-up done, lol. lol I should probably spend longer on it but just can’t be bothered!